The August edition of Tabletalk is out. 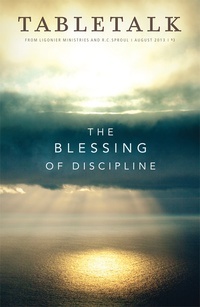 This issue examines the blessing of discipline. To use the words “blessing” and “discipline” in the same sentence sounds strange to our modern ears, but that is precisely why it is important to address the issue from a biblical perspective. Although Scripture speaks often about the goodness of godly discipline, many in our culture and even within our churches do not consider discipline to be a blessing. We think discipline conflicts with Christian liberty. We think discipline is a synonym for tyranny. In short, we think incorrectly. We forget that discipline begins with God and is grounded in His love for us, and we forget that all other forms of discipline reflect the loving discipline of God. Contributors include R.C. Sproul along with J. Mark Beach, Steven J. Lawson, Tom Ascol, Fred Greco, Alexander Strauch, R.C. Sproul Jr., Elyse Fitzpatrick, Phil Johnson, Dave Furman and Michael Oh. If you have not yet subscribed to Tabletalk, now is the perfect time. Your print subscription also gives you free access to the digital edition of Tabletalk. For those living in the U.S. and Canada it’s only $23 for a year, and $20 to renew. You save even more if you get a 2- or 3-year subscription (as little as $1.36 per issue). We offer special discounts for churches or businesses who want multiple copies of each issue. Get your subscription to Tabletalk today by calling one of Ligonier Ministries’ resource consultants at 800-435-4343 or by subscribing online.